For many of us that have grown up with the internet, it’s hard to imagine a world where music and film and games and literature aren’t readily available–for free–somewhere on the internet. The internet has enabled us to access to whatever music we want, whenever we want, wherever we want–but, contrary to popular belief, this unlimited accessibility doesn’t come without a cost. Instead, we’re shortchanging the artists, and that’s incredibly lame. 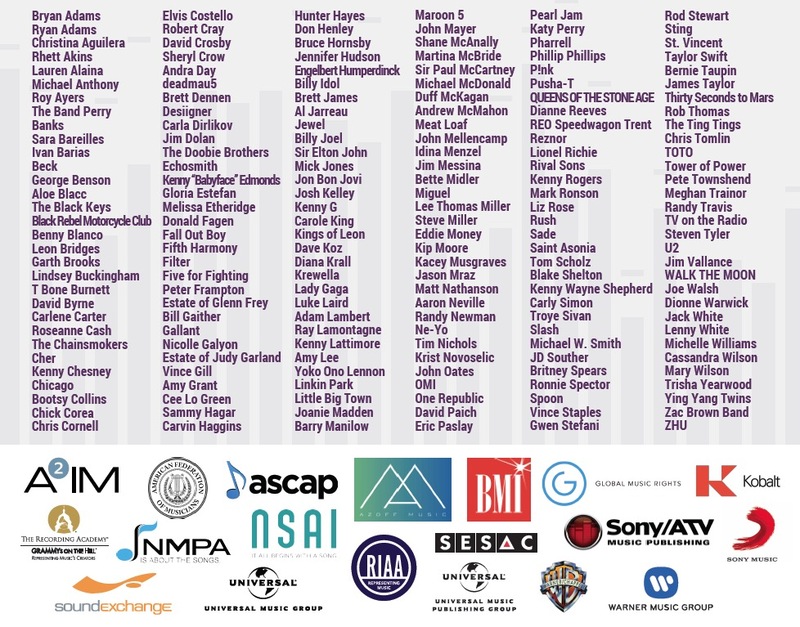 A rockstar-studded force of industry top-brass has assembled in an effort to urge Congress to reform the 1998 Digital Millennium Copyright Act (DMCA) to provide new standards of transparency in calculating royalties. Their primary culprit? YouTube. YouTube in particular shields itself through the ‘safe harbor’ provision–which prevents the company from being punished for copyright infringement so long as they respond to takedown notices. However, DMCA lacks the teeth to allow individual artists–or even large groups of artists in the case of Universal Music Group–to fight larger stakeholders such as Apple or YouTube’s parent company, Google. In the end, the DMCA appears to be most effective at punishing individual content publishers for posting videos of the their cats dancing to Beyonce’s newest single without first obtaining a license. Big time criminals. YouTube meanwhile brings in revenue streams from all of its videos–and because it’s impossible to submit takedown notices for every unlicensed video–the artists end up with nothing in their pockets, while YouTube continues to bring in large profits, without being held to a higher standard of transparency. On The other hand, Do we really need to vilify every tech firm that offers a music sharing service simply because they figured out the rules of the game faster than the rest of the music industry could catch up? YouTube needs to change it’s model–but it’s a complex issue. Even if there was a more transparent model, one that allocated royalties based on a clearly known quantity of videos being watched or music being streamed at any given time, the process of dispersing royalties would still have to go through several layers–including major record label companies–before trickling back down to the artists. Some have argued that if these streaming services can get it right, the music industry might be able to to convince our generation that its time to pay up. On top of there being a strict standard of transparency, artists also need to arm themselves with more information regarding the royalties–a process that many artists are oblivious to so they can better judge their own recording contracts. We’re really spoiled. Back in the day in order to listen to a new album, you didn’t get to just click a button and instantly listen to the new song. You had to get up, put clothes on, and go to the nearest record store, hand over money, buy a giant plastic disk in a cardboard sleeve, take it all the way back home, and place that giant wobbly disc on a spinning rubber wheel, dangle a fragile metal pin over it just so, as to cause the pin to scratch the plastic disc at 78 rotations per minute, so the new song you desired to hear 4 hours earlier would play. Heavens forbid that fragile metal pin snapped, or your power went out, or someone walked across the room during a good part of a song. So at the very least, we can do our part to appreciate the convenience technology has provided us–that doesn’t mean never stream free music again, or never burn your friends a playlist of your favorite songs–that’s a ridiculous standard to try and achieve. It just means being aware of the obstacles facing new artists. It also means supporting new artists by, when you can afford it, purchasing some music (YASSOU ; TOW3RS ; IDGY) and giving yourself a giant pat on the back. At ATYPICALSOUNDS, we’re dedicated to emerging artists–but more than ever, it’s really tough to make a living playing music. Too many stakeholders are taking too big of a cut–and unless we can established new standards of transparency, the grave reality is that artists might no longer be able to call their passion, their profession. Let’s not let it get to that point.